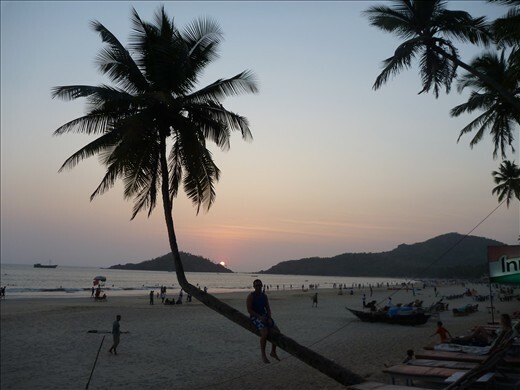 So, after 3 nights in Mumbai it was time to head to Palolem, Goa. The overnight train was eventful to say the least. First of all it was delayed then shortly after leaving Mumbai we stopped off and about a million local people piled onto the train! They covered every square inch possible. After a short nap I woke to find one in my sleeper bed. Other popular places they chose to sit were in the nasty toilets! On the train we met a nice couple from Dorset, Dave and Jen. We stuck with them and found a basic beach hut at Neptune Point, less than £5 a night for me and pete! We dumped our bags and went to explore Palolem beach. It was absolutely beautiful! A perfect curve of golden sand in a crescent shape lined with palm tree's hanging over the beach. I knew straight away I was going to love this place! On our first night me and pete watched our first indian sunset sipping cocktails on the beach. The next night was the silent disco (due to the ban on amplified music after 10pm). So everyone is given a set of headphones and has the choice of 3 channels to switch too. Here we met up with the english girls from Mumbai, Helen and Nicola. This place is just coming to the end of the season as the moonsoon looms but there was still enough people to make a good party. The next morning pete went for a haircut, it seemed to be going fine so I left him and went for something to eat. 10 minutes later he turned up looking like an escaped convict with no hair! Haha!